the A&M invests in an annual track program. 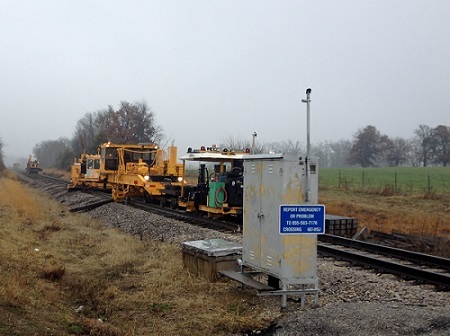 Under the 2015 program, the A&M will be replacing six turnouts, executing a major upgrade to a crossing at Highway 264 in Springdale, Ark., installing additional tracks at the new OTI Butterfield facility, rail grinding, and completing multiple drainage projects along the main line. Other regular maintenance items include weed spraying and brush cutting along the A&M's right of way, dumping some 5,000 tons of ballast and the replacement and cleanup of old ties. The tie replacement and cleanup is already underway on the A&M. 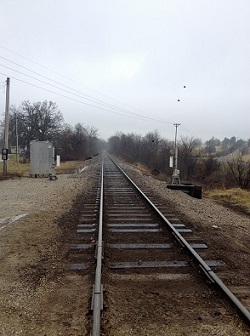 This year's program allows for the installation of approximately 12,000 ties along the A&M's main line, from Monett, Mo. to south to Exeter, Mo. An additional 6,000 ties are scheduled for replacement in Bentonville and Van Buren, Ark. According to Maintenance of Way Manager Randell James, crews consisiting of both A&M workers and sub-contractors are working diligently to complete the tie replacements and cleanup ahead of the busy spring and summer seasons. With only ten maintenance of way workers and 150 miles of track to maintain, the 2015 Track Program will keep the department hopping all year! A&M offers a range of logistics and transportation services to its valued clients, ensuring long-term success of the company and communities it serves. 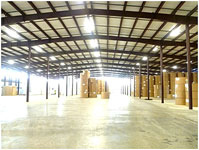 Sister company Ozark Transmodal Inc. added 60,000 square feet to its Fort Smith warehouse, primarily for Graphic Packaging Inc. storage. Additionally, two new rail doors with hydraulic dock levelers were installed to help unload railcars better and faster. 3/6/15 - RPCX 8322 now the "Spirit of Arkansas" car #109 has been online operating since June 2014. The National Railway Historical Society held their national convention in NW Arkansas and was the first group to enjoy this new addition to the A&M. The interior restoration was primarly done inhouse. This year look for the exterior numbering and A&M color scheme to be added. The "Spirit of Arkansas" provides additional seating and is great for entertaining. 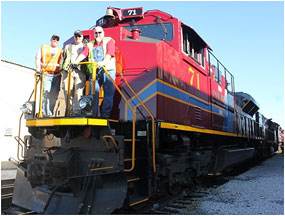 A&M recently received a RPCX 8322 car from the Dennison Railroad Depot Museum in Dennison, Ohio. 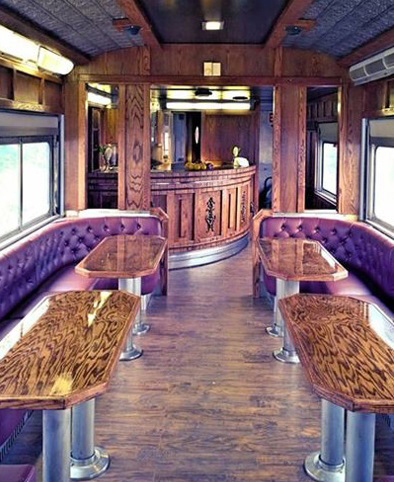 Built as part of the "Pride of Texas" series for the Southern Pacific's Sunset Limited in 1950 as a diner bar/lounge, the self-contained car features a 240–3 phase AC motor powered by a Stadco genset, electric baseboard heat and R134a air conditioning systems. In anticipation of retiring all but 10 of its ALCO locomotives, the short line decided it was time to invest in more units for its fleet. A&M picked up its three new EMD locomotives — Nos. 70, 71 and 72 — Sept. 11 in Monett. The locomotive engineers and conductors who operate them say it's an honor and a privilege. HOUSTON, May 29, 2014 /PRNewswire/ -- Global energy and commodity price reporting agency Argus has named the Arkansas and Missouri Railroad and APAC Central, a division of Oldcastle Materials, as the 2014 recipients of its prestigious Win-Win Award.